How to Make Family Mealtime Fun! Life can get hectic, so quality time with your kids can often feel infrequent and always feels too short. Throw smartphones, tv, and computers into the mix, and it makes it difficult to really connect with one another and have everyone be present in the moment. One of the best ways to spend time with your kids is to start a new tradition of eating dinner together, and make it a more timely activity that gets your kids involved and excited about throwing a recipe together that they made from scratch! Not only is this a great way to spend quality time with your little ones, but it also teaches them important life lessons along the way. 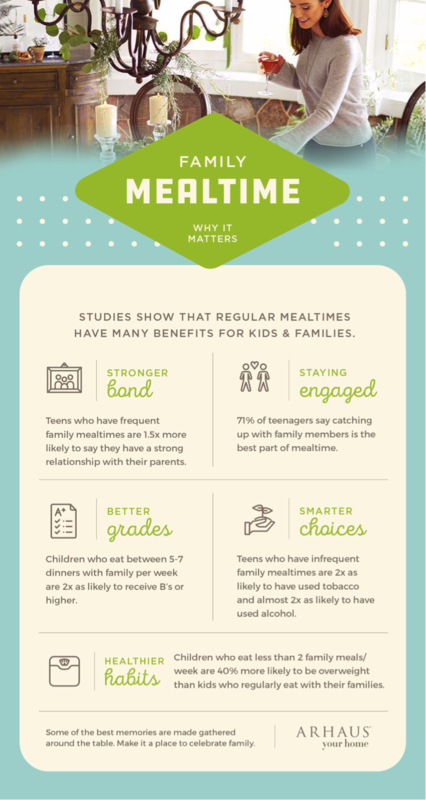 Recent studies have found that shared mealtimes have many benefits for family wellness, which are further explained in the graphic below. So, get your cooking utensils ready, and try this day plan for creating the perfect dinner for family mealtime. Before all else, you have to find a perfect recipe that will appeal to even the pickiest of eaters. Pinterest is a great place to start! Scroll through the “food” or “recipe” pinboards with your kids and create your own board to save recipes for current and future meal times. Or, maybe you have an old family recipe book to pull some traditional recipes from. This is a great opportunity to share some of your heritage and family traditions with your kids, and share your favorite dishes from when you were growing up. If you’re looking for healthy recipes, or if you have any family members with dietary restrictions (i.e. vegan or vegetarian) or food allergies, EatingWell is a great site to check out too! It offers authoritative insights to help make healthy eating a way of life for you and your family. The website also features a multitude of recipes that appeal to a wide range of dietary needs and appeal to a wide range of palettes. Once your kids have come to a consensus on the recipe of choice, it’s on to the next step: buying the ingredients! 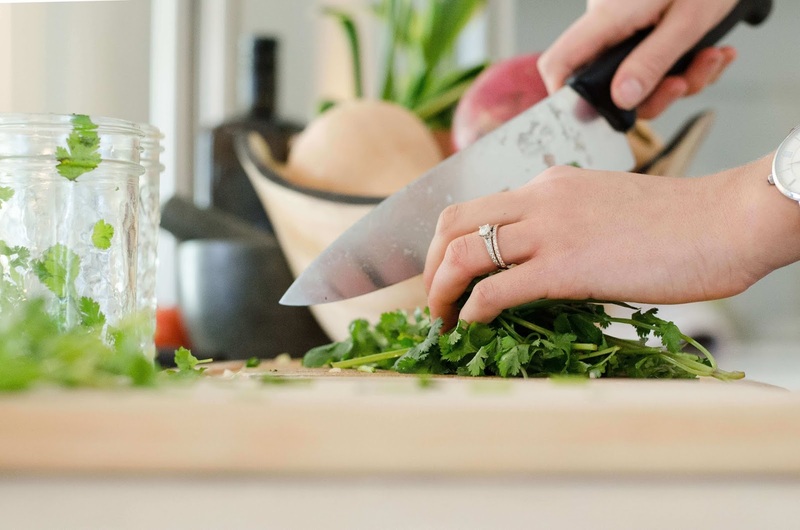 Once you have decided on a recipe, it’s time to hit the road and head to your local grocer or farmers market. 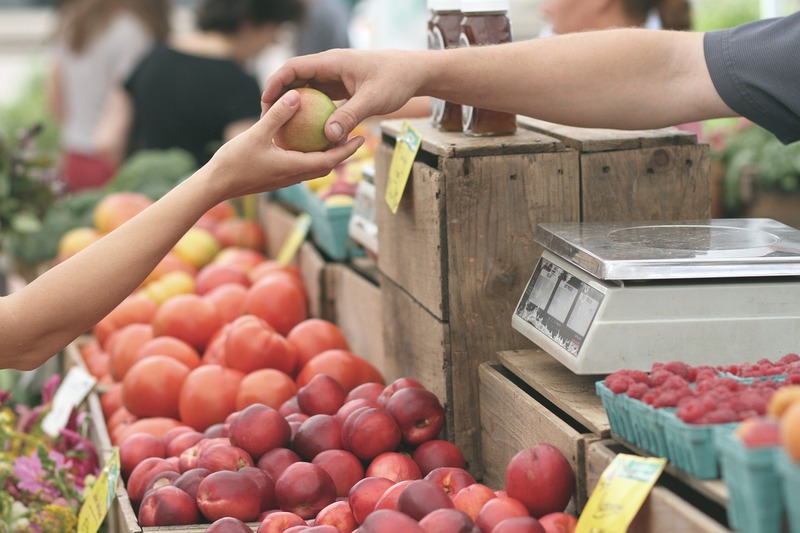 The farmers market is a great place to show your kids where they can find fresh, locally-sourced produce, and explain to them the benefits of supporting local farmers. Farm-to-table doesn’t have to only happen in pricey restaurants, and can and should become a habit in your home. Do some research prior to taking the trip to the market to get some background on the benefits of organic produce. As you stroll from vendor to vendor, throw in words of wisdom about the benefits of eating organic, or why eating healthy, nourishing meals is important, using produce on display as examples. Lastly, before heading home, let your kids roam the market to find fresh fruits or veggies they want to try, and let them pick one item each to have as a little mid-day snack before heading home. When you are home and have unloaded your groceries, it's time to get cooking! Encourage your kids to be hands-on and help them take the lead in cooking and preparing the meal. Show them techniques and safety tips when in the kitchen, and talk to them about different ways to combine flavors. Making this dinner from scratch will give your children a deeper appreciation for their meal. When waiting for things to cook, bake or simmer, have the kids help you wash the dishes and clean up the mess on the counters and tables before it’s time to eat. Have them set the table as well, and maybe make it a race to see who can set their place the fastest to make it less of a chore. When everything is cooked and ready to serve, keep things upbeat by creating another game to see who can make the prettiest dish! Finally, it’s time for the moment you all have been waiting for-- dinner! Gather around your family dining table, adorned with table settings and your homemade meal. Make sure cell phones and other electronics are left in their rooms so there are no distractions from the meal or conversations (Parents have to follow this rule too). Start a conversation by asking what they learned from the day, and what their favorite and least favorite parts were. 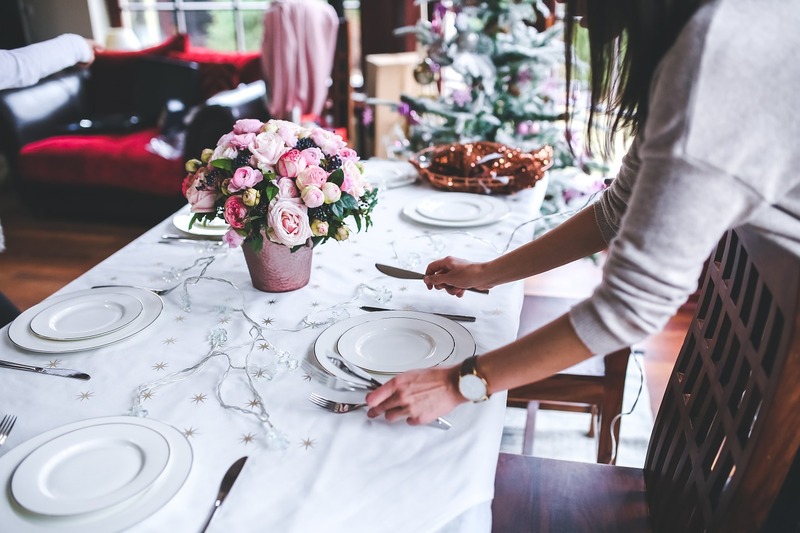 This can give you insight as to what you can do differently the next time your family chooses and prepares a meal together, and your children will appreciate having their feedback listened to. Then you all can decide on another recipe for the next week!